Wei Yi has broken all kinds of rating and age records throughout his lifetime. The world’s youngest Grandmaster at the moment, and one of the youngest in history, Yi is also the youngest player in history to break the 2600 rating barrier. His quick progress is apparent, earning both the International Master and Grandmaster titles in the same year. Now that his rating has peaked at it’s best, Yi is increasing it every tournament and working toward the super-Grandmaster level. Wei Yi first played in a FIDE tournament when he played in the Chinese Championship Group B in 2007 at the age of 8. In this tournament he actually won a game against a FIDE Master and drew a Grandmaster. In 2010 Yi won first place in the Asian Youth Championship U-12 section. Later in 2010 he won the World U-12 Championship ahead of future Grandmasters Kayden Troff and Jan-Krzysztof Duda. This championship victory earned Yi the FIDE Master title. In 2012, Yi played in the World Junior Championship and lead the tournament at one point, eventually finishing 11th. He also played in the same World Junior Championship tournament in 2013 and finished in 7th place this time. 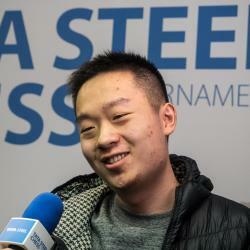 Yi won his International Master norms at the 2012 Aeroflot Open and Asian Continental Championship tournaments and became an International Master before he was 13 years old. His Grandmaster norms came at the 2012 World Junior Championship, 2012 Indonesia Open Championship and 2013 Reykjavik Open. Yi was the world’s youngest Grandmaster when he earned the title, being only 13 years 8 months and 23 days old. At the time this put him as the fourth youngest Grandmaster in history behind Sergey Karjakin, Parimarjan Negi and Magnus Carlsen. Being considered among this elite class of names, and now with the Grandmaster title attained, Yi has been raising his rating ever since. He has recently peaked at a rating of 2728 (December 2018).